Credit: YMHA/YWHA building at 15 Brunswick Avenue in Toronto, c. 1960. Photo courtesy of the Ontario Jewish Archives. YMHA/YWHA building at 15 Brunswick Avenue in Toronto, c. 1960. Photo courtesy of the Ontario Jewish Archives. 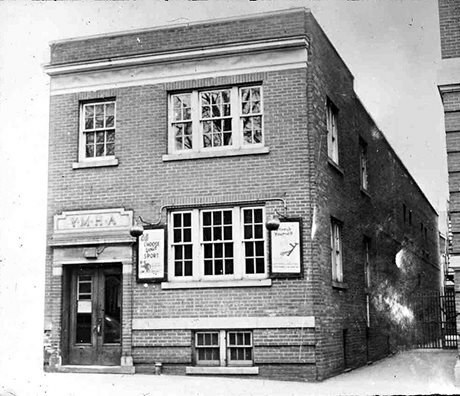 The Young Men’s and Women’s Hebrew Associations (YMHA/YWHA) were formed at the beginning of the 20th century to provide a place for Toronto’s Jewish youth to participate in recreational activities and to socialize. Due to discrimination in the first half of the 20th century, many Jewish immigrants were barred from participation in amateur sport leagues or clubs. In 1919, to meet growing needs, 21 smaller clubs in Toronto amalgamated as the YMHA/YWHA. The primary focus of the club was athletics, but they also offered educational and cultural programs. As enrolment increased, new facilities were built on Brunswick Avenue in 1937. This new club offered a wide range of sports, including the use of a gym and pool. In the 1940s, regulation-size courts were added to the building, the only ones in the city at the time. In 1953, a new facility was built at Bloor Street at Spadina Avenue, which is today the Miles Nadal Jewish Community Centre. Since 1953, other Jewish community centres have opened in the province and follow the original mandate of the YMHA/YWHA. See the online exhibit created by the Ontario Jewish Archives on the history of the YMHA. Learn more about the Miles Nadal Jewish Community Centre on their website. Read more about the United Jewish Appeal Federation on the Ontario Jewish Archives website.